Habits of the World's Happiest People #Infographic ~ Visualistan '+g+"
Happiness is more than just an emotion; it’s a journey and a state of mind. In the words of the Dalai Lama, “Our survival is based on hope- hope for something good: happiness. 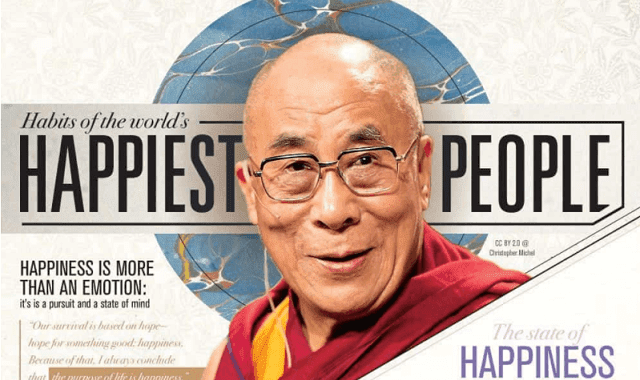 Because of that, I always conclude that the purpose of life is happiness.” Though true happiness is subjective and deeply personal, we can all take pieces of wisdom from the world’s happiest people and apply them to our own journeys. Psychologists surmise that a good life needs a healthy mix of purpose, playfulness, flexibility, and yes, happiness. With our natural inclination to form routines and habits, the road to happiness is no different. By developing happy habits like expressing gratitude, helping others, practicing compassion for others and also yourself, and simply just smiling boost our optimism and encourage happy behavior. Our happiness is not necessarily a reaction to our environment, however 40% of our happiness is controlled by isolated events in our lives and we have a 34% increased change of feeling happy if a next door neighbor becomes happy. There is no secret formula to being happy but we must come to the conclusion that we are responsible for our own happiness. How do you define happiness? Take a look at this infographic for more on the science of happiness and what it takes to make happiness a habit and way of life.